During the winter, most advertisements that bring up Canadian climate like to emphasize just how uniformly cold the country is. Trucks plow through barely cleared roads; vacation deprived folks bemoan having to clear their walk again, and shinny is played on every field and street. It’s a fairly popular appeal—Canadians are cast as having managed to overcome, and indeed embrace, the challenges of our long winter. (The fact that winters are warming and shrinking seems to have escaped the attention of advertisement agencies). However, in the early twentieth century, this image of the Great White North was precisely the one that tobacco interests sought to overcome. After a long hiatus, farmers in Essex County were enticed into growing tobacco after it began attracting higher prices, partially due to new protective tariffs. However, creating a sustainable foundation for the sale of their crop was a challenge. The first great tobacco magnate of Canada, William C. Macdonald, famously declined to buy any Canadian grown tobacco for his brands. Why? Canada was too cold. Try growing figs, or oranges, Macdonald scoffed. His opinion had a lasting impact on the perception of Canadian tobacco. Thus began the great effort to recast Southwest Ontario as a sunny place, distinct from the cold climate that shaped the rest of the country. Some of my favourite descriptions found in newspapers include ‘semi-tropical,’ ‘the sun parlour of Canada,’ and—perhaps stretching reality a little bit—the ‘banana belt’ of South Essex. Local writers and farmers were quick to defend their climate as ideal for most tobacco cultivation, and were joyous when their tobacco was deemed the equal of American grown at exhibitions in Britain and elsewhere. They pointed to this as clear evidence that Ontario tobacco could succeed. The Imperial Tobacco Company of Canada, formed in 1908, was less hesitant to adopt Canadian grown tobacco, and encouraged this climatic recasting of Southern Ontario. Their interest in the Canadian-grown weed grew to the point where they held a controlling position of the market, and set the price in most years. However, the company (and the farmers) still sensed that the perception persisted Canada was far too cold for quality tobacco. To overcome this, the company launched a ‘Picobac’ Burley pipe tobacco line in 1933. The early advertisements relied on colourful stories about the life of ‘Mr. Picobac,’ the ‘Essex County philosopher.’ He launched a ‘tour’ where he expounded on the greatness of Canada and the virtues of Essex County, frequently from a sunny step in front of a post office. In the pictured advertisement, Picobac’s success is part of the broader story of Canadian development. He was a busy fellow, going from barber shop to worker rally to tell people about the virtues of the ‘mild…cool…sweet smoke’ in his pipe (and, in the case of the latter, to caution against any ‘radical’ action). The ad writers probably had the older demographic, who were more inclined to purchase pipe tobacco, in mind. For this audience, Mr. Picobac exudes warmth, familiarity, and stability. In true paternal (and patriarchal) fashion, he advised one young man of the dual advantages of Essex County, the girls and the warm environment. Climate, more so than women, is a recurring theme in the copy. 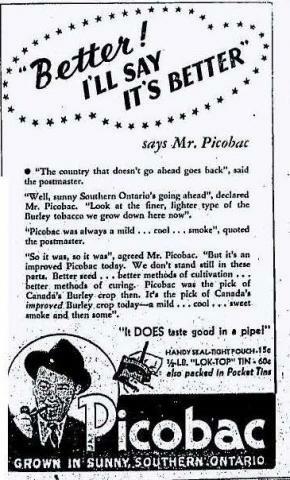 Picobac was ‘Grown in Sunny Southern Ontario.’ One ad copy presented the pastoral image of tobacco growing alongside rows of peaches, apples, and other summertime fruits. Indeed, Picobac ads frequently sought to frame tobacco cultivation as part of the natural landscape of Essex—of course, quality tobacco could be grown in the sunny fields of Southern Ontario. All it took was a bit of gumption and modern farming techniques. The Picobac advertisements disappear around the end of the Second World War. However, the brand seems to have have stuck around for longer—I found a reference to Imperial discontinuing the brand in 1969. The commercial importance of them shouldn’t be exaggerated. Following the war, the dominance well-known cigarette brands such as Marlboro and Players only increased. However, the Picobac campaign provides an interesting moment where farmer and company interests converged—they both benefited from a campaign that extolled the virtues of warm, sunny Southern Ontario. For a period, at least one advertisement campaign tried to disrupt the image of a frozen Canada to prepare Canadian consumers for high quality Burley pipe tobacco. A source note: a quick word search on the Our Ontario newspaper site (http://ink.ourontario.ca) will generate many Picobac ads, should you be interested in the adventures of Mr. Picobac!